The 4th UCLG World Congress will be celebrated in Rabat from 1st to 4th October 2013, at the Hotel Sofitel Rabat Jardin Des Roses. All official sessions of the Summit will include interpretation in English, French, Arabic and Spanish. Participants will be responsible for managing their own travel arrangements. 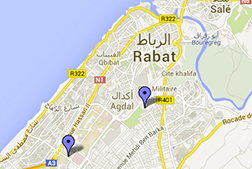 Rabat has direct air connections in the capital city’s airport or through Casablanca airport. Several international airlines fly regularly to and from these airports on a daily basis.